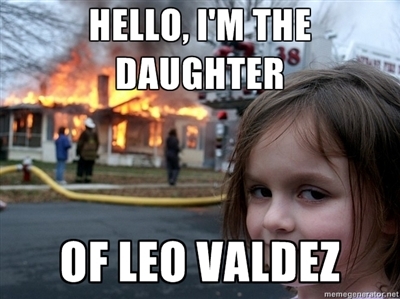 Leo's Daughter... (Meme). . Wallpaper and background images in the The Heroes of Olympus club tagged: the heroes of olympus the lost hero leo daughter fire funny fanart meme. This The Heroes of Olympus fan art might contain سائن ان کریں, پوسٹر, متن, چاکبورڈ, نشانی, تختۂ چاک, ڈاؤن لوڈ ہونے والے, مزاحیہ کتاب, منگا, کارٹون, ہالی ووڈ, کامک بُک, پورٹریٹ, آرچر, closeup, تصویر, and ہیڈشوٹ. Camp Half-blood یا Camp Jupiter?? OMG i have this photo on my phone HA! lmao! my new computer wallpaper! coool. btw why is there a fire? She. is. the. daughter. of. Leo. Valdez. ...who is a fire user.